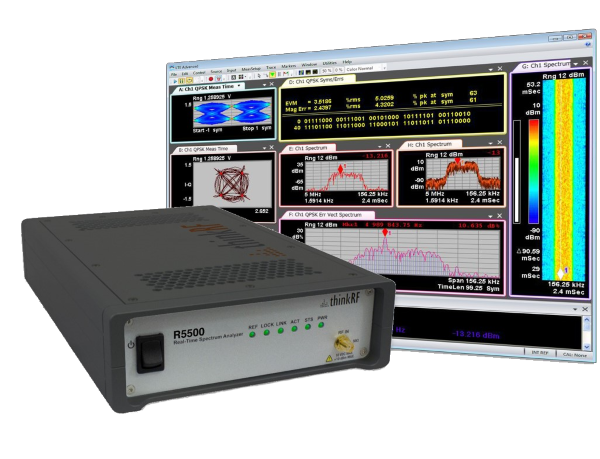 The most complete third-party integration with leading Keysight software allows users to monitor complex waveforms in more locations with the PC-driven and remotely deployable ThinkRF R5500 analyzer. ThinkRF Corp., the leader in software-defined spectrum analysis solutions, today announced the release of the ThinkRF E300 Enabler for Keysight 89600 VSA. The E300 Enabler is the first and most complete third-party integration with leading Keysight software. Users in aerospace & defense, government, and regulatory monitoring can now leverage the low-cost, flexible, and remotely deployable ThinkRF R5500 Real-Time Spectrum Analyzer for complete vector signal analysis. The combined solution provides an integrated and easy-to-use platform that supports over 75 modulation types, enablers greater insight into captured signals, and allows users to make consistent measurements across multiple deployments, including portable, remote, and distributed. The E300 Enabler is now available for ordering from ThinkRF. Contact Sales for more information. ThinkRF is the leader in software-defined spectrum analysis solutions that monitor, detect and analyze complex waveforms in today’s rapidly evolving wireless landscape. Built on patented technology and quality by design principles, the ThinkRF platform offers greater versatility, better performance and additional capabilities for 5G, monitoring, Signals Intelligence (SIGINT), Technical surveillance counter measures (TSCM), and test and measurement applications. Aerospace and defense companies, spectrum regulators and wireless communications providers use the remotely deployable, PC-driven and easily upgraded platform to replace traditional lab equipment for wireless spectrum analysis.